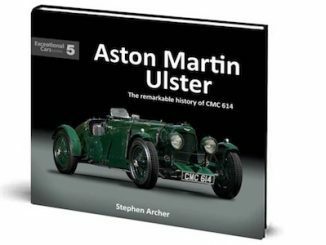 Build your library of British automotive books, manuals, and other literature. This section contains everything a well-stocked library might as well as book reviews and maybe even the occasional technical diagram. A new engineer joined Great Britain’s sacred immortals at ceremonies here today. Emerging from the shadows, Reid Antony Railton stepped into the limelight of a spectacular career in the service of speed. His life and achievements are being celebrated by author Karl Ludvigsen in a new book titled Reid Railton — Man of Speed. ‘After World War 2’, said author and Railton expert Karl Ludvigsen,’ Britain often held the Triple Crown of Speed on land, sea and air. Railton’s vehicles were responsible for the absolute speed records on land and water.’ Speed kings Sir Malcolm Campbell, John Cobb and Goldie Gardner rode to fame in Railton-engineered craft. Car designs from his draughting board for Campbell were the first to 250 mph and 300 mph. The First Three Shelby Cobras – The Sports Cars that Changed the Game is the fourth in the Exceptional Cars series from Porter Press. Produced with the same handsome attention to details as their other books, this volume details the story of three cars important to modern sports car history and Cobras in particular – the first AC Cobras created by the legendary Carroll Shelby in 1962. The prototype Cobra, CSX2000, has been described as ‘the most important modern American car’, although it was built on a British AC Ace chassis with an American Ford V8 engine. CSX2001 was the first production Cobra and CSX2002 the first to race, leading to a series of competition successes that made Shelby’s Cobras famous and a favorite of sports-car enthusiasts throughout the world.